Taylored Life: Audrey is 18 Months Old! Audrey is 18 months old today! It's hard to believe how much she has grown and changed since her birthday. She's talking a good bit now, and loves to imitate EVERYTHING Jackson does...good or bad. Looking back at the post from when Jackson was 18 months old, they are very similar developmentally. Audrey could probably be drinking exclusively from a cup, but we still give her a sippy cup frequently at home to make our lives easier. They only give her a cup at school, so she gets lots of practice there. She also eats with a fork and spoon really well aside from turning them upside down when they get to her mouth. Just like Jackson, she loves to dance and sing songs. Her favorites are even similar to Jackson's at this age. I love watching the two of them hold hands and sing Ring Around the Rosie. Audrey likes to fall down almost as soon as they start! She has also started trying to count, which is really cute. The numbers all sound different and have a particular cadence, but only a few of them sound like the real number. 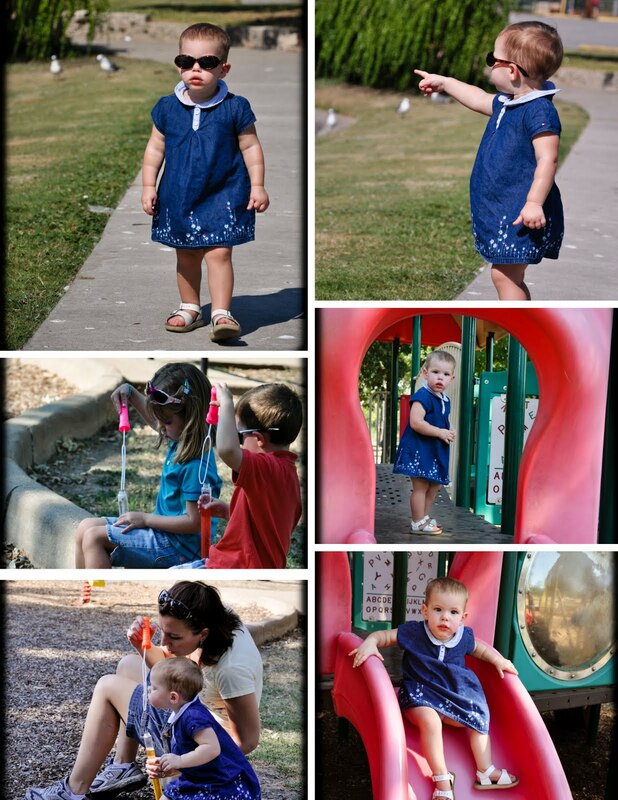 Audrey loves playing at the park, which we did today with the Fulliloves. The swing, the slide, and the bubbles the Fulliloves brought were given lots of attention! We also visited the geese. Audrey was looking pretty cool with her shades on! There are a few more pictures from the park in the album.